In what room does a person spend a significant period of his life? That’s right, it is in the bedroom. Here you spend thirty percent of your life. That’s why it is the most important room. Its interior and stylistic approach should be appropriate. It is important to choose the style of the bedroom interior; it is important what kind of furniture here will be. And no less important is the lighting of the bedroom. Agree how wonderful it is to wake up in the morning from the rays of the rising sun breaking through the trees outside. Let’s see how we can change and adopt the window design in the bedroom for ultimate coziness and comfort. And this delightful feeling you will experience only with the appropriate design of the windows of the bedroom. At first glance it seems that the design of the windows in the bedroom is not such a difficult thing. In fact, this is pure creativity. Creativity which is an essential part of the interior design of any room including the bedroom. The perception of your bedroom, its coziness depends on the size of the window, its configuration. 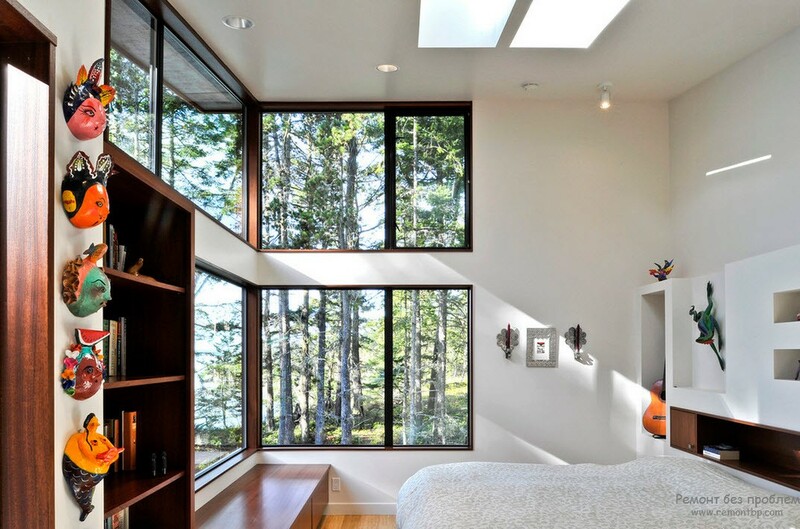 Let’s review what effect do windows have on the look of the bedroom? Large windows immediately impress the person who entered the bedroom. What is impressive is not so much the size of the windows, as the view that opens behind them. It is desirable that this view is beautiful. It is unlikely that a look of textile factory or a plant with smoking pipes will cause the feeling of affection and bliss. If you are not the director of this factory, of course. But the size of the windows should also have a sense of proportion. It is doubtful that the bedroom will be a cozy resting place if you will be in the palm of the outside world. Even if you are outgoing person without complexes. After all, a bedroom is a place where a person can retire and relax at any time of the day. However, it is a matter of taste. Natural lighting in the bedroom is good. The more the better. This is on the one hand. On the other hand, the larger the source of this lighting (that is, the window), the less will be sound and thermal insulation in your bedroom. Especially if the windows have only two panes and their area is a third of your bedroom. At the same time, a substantial part of this third is located at the head of your bed. It is clear that during noisy and cold winter bedroom will never be a cozy place. It is known that moderation and in timeliness is great. But what if you want to relax for a couple of hours in broad daylight, and outside the window the sun beats into the huge windows of your bedroom, cars are buzzing, the frost is cracking? Fortunately, not everything is as bad as you just thought. What will help keep the bedroom warm, cozy and peaceful? Curtains will be the design element of the window which will save you at the right time from excess light, prying eyes and other inconveniences. That is, they will help to create comfort and peace in the bedroom. In the modern design of the bedroom windows’ roller blinds are often used. They are very comfortable to use. The fabric of these curtains can be different in density, that is, light transmission. But if these curtains will seem to you somewhat primitive, although practical, you should not put them aside. Roller blinds can be complemented by regular curtains of tulle. Roman blinds are becoming popular again today. They are simple and economical to produce, which affects their value. The latter is a significant plus of these curtains. But the curtains are not only a practical component of the design of windows. Curtains are the final element of the entire interior of the bedroom. With their help you can emphasize the style in which the bedroom is decorated. Therefore, the curtains should be carefully selected to correspond the existing style of the interior design of the bedroom. Therefore, before you buy curtains, you should decide on the style of the bedroom interior first. This is an axiom. Roller blinds fit well in the Scandinavian style. Straight curtains with sliding system will be in place in the style of minimalism. For high-tech style, curtains in the form of blinds will be more appropriate, since this style welcomes practicality. Blinds allow you to adjust the natural lighting in the widest range, which is very convenient in all cases of life. The design of the window with a built-in bed looks original. Simultaneously with the built-in bed, it is possible to install small shelves for books, bed linen and other trifles in the window opening. It is very convenient and practical. Blinds will look the most successful with this window-couch. There are other options for window-sofa. 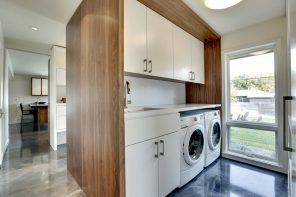 For example, adjacent wardrobes fit harmoniously into the interior. And in the case of the sofa you can make a great place to store bed linen. Increasingly, modern architecture uses the technique of enlarging the area of ​​a room as its part protruding beyond the main perimeter of the building. Most often, this technique is used for the bedroom. The projection is a large window with a different design. This allows you to increase the natural light of the room, the angle of the view to the outside world. Know that the bedroom is primarily designed for you, not for guests. Therefore, everything in it should meet your needs. Of course, we include the windows and their design. Do not pursue fashion. Not everything is gold that glitters. It may well be that the trendy window design does not please you at all. And do not forget – the windows should be first of all warm, and only then beautiful. This is the most important task in their design. Good luck!